5793 labyrinths found. Showing 4741-4760. Sorted by country, state, city, then zip/postal code. The labyrinth was a community project and is open to the public. It is a refreshing calm space on a busy corner in Doylestown PA, the county seat of Bucks County. Open to the public from dawn to dusk - behind the house, no need to ring the door bell, just walk back and enjoy. Portable canvas labyrinth; I will come to your organization, college/university, church, etc. I am located near Pittsburgh. Situated 1 mile west of New Buffalo on Rt. 11&15 just 40 minutes north of Harrisburg, PA.
Open the 3rd Sat. & Sun. of each month from 11am to 5pm Oct. thru. March & 11am to 7pm April thru. Sept. Location: to the left of the church building, set back in the meadow between wildflower gardens. Park to the far left of the lot along the evergreen tree line. Information: our labyrinth is much like the spirit of our church. It is welcoming and powerful; a special place for reflection, peace and pause. We are thrilled to share this gift with visitors. Please, daylight hours only. The labyrinth is open year-round, but may not be in top condition during winter months. 3-circuit, concentric ceremonial design was created in 2007 by Marisa DeSentis as her Girl Scout Gold Award project. In 2012, Ryne Gade refurbished the Labyrinth for his Boy Scout Eagle project. Benches for meditation or journaling are placed nearby. The Emmaus Walk is on the corner of Elm and Keystone Streets. Just off Wertzville Rd ex Rt 81 - the Labyrinth is located behind the church building and down the hill, there is also a Peace Garden. 2. End of ramp head RIGHT onto Rt 114 West. 3. Follow Rt 114 W until it ends (about a mile) at a red light. 7. The house number is 35A and there's usually a sign at end of the driveway. 8. Park anywhere near or in the FRONT YARD... Welcome to the Circle! Please contact before arriving. You are able to schedule a visit by appointment. 8th St. and Seminole Dr. The Carrie T. Watson Garden Club labyrinth is located in the southwest corner of the Lake Erie Arboretum at Frontier Park (LEAF), at the west end of the Bayfront Parkway along Lake Erie. Patterned after the Chartres labyrinth. Please contact Reverend Jane for directions. Please contact Reverend Jane for availability. Over 900 stones from across the world, inlaid with small white pebbles. The labyrinth is located behind the church, between the church and the church office. Park in the main parking lot and walk across the grass near the flagpole to find the labyrinth. Facing the Youghiogheny River, the Riverside Hotel inn and restaurant offers rooms with queen and full size beds and private baths, wifi and ambience for your getting away from it all. Relax along the river or walk the labyrinth next to our garden where we serve dinners from seasonally. This is called the Raven Labyrinth and weaves around large pine trees in a dense forest. Chain saw carved animals are located at turns and the center allows a meditating view of a circle of pine tops when you lay on your back. 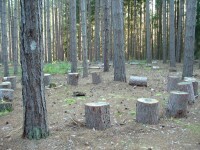 This labyrinth is in the middle of Tioga State Forest near the edge of Camp Eaglebear. It would be best to contact Paula Martin or Lee Anne Dolan for specific directions. Path is outlined with pine branches and logs. 41 36.843 N° Lat. ; 77 31.648 W° Long. From Gettysburg follow 116 West approximately 3 miles, the Holistic Health Center is on the right, the Labyrinth is to the side. The labyrinth is located between the stone house and the church. The church is about two miles from downtown Glen Rock. 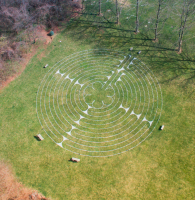 The labyrinth is available to the public, and we encourage people to take advantage of daylight hours. A boy scout built the labyrinth for his eagle project.